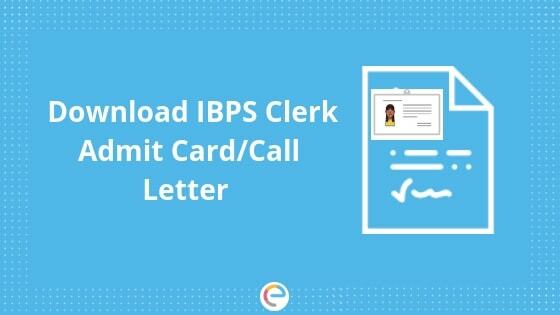 IBPS Clerk Admit Card 2019-20: IBPS Clerk Admit Card for Mains has been released by the Institute of Banking Personnel Selection. The IBPS Call Letter will be released by the month of December 2019. Candidates can visit the official website for download the admit card from the official website for IBPS Clerk Admit Card download. IBPS Prelims exam will commence from 7th, 8th, 14th, and 15th December 2019. IBPS Mains exam will be conducted on the 19th January 2020 and the last date to download the Admit card is the day of the exam. IBPS Clerk is one of the most popular government jobs – Sarkari Naukri – in India. More than twenty lakh aspirants are expected to appear for this year’s CWE – Clerks – VIII examination. This implies the level of competition that this year’s aspirants will face. With the increasing complexity in the nature of examination over the years, it is advised to be fully prepared for even the most challenging paper. Also, it is our humble request to the aspirants to not panic over the high competitiveness of the examination but to use it to your advantage. All you need to do is strategize, focus, finish your syllabus and revise it well in time. We wish all the aspirants for this year our very best. Note: At Embibe, we have ensured that the aspirants avail mock tests free of cost. We suggest you attempt our mock tests and evaluate yourself before appearing for the examination this year. Institute of Banking Personnel Selection (IBPS) will issue the IBPS Clerk admit card for pre-examination training in November 2019. The candidates will be able to download the admit card from the official website of IBPS. Make sure you download your CWE-Clerks-VIII pre-exam training call letters before the last date. Q1. How can I download my CWE-Clerks-VIII Admit Card? A1. The complete procedure to download the IBPS Clerk admit card has been explained above. Q2.What if the page doesn’t load properly while accessing the IBPS Clerk Admit Card? A2. There can be multiple reasons for the delay in page loading like the speed of the internet, server issues etc. So, to make sure you download the IBPS Clerk admit card on time, visit the website during non-peak hours. Q3. How do I access the registration number before downloading the IBPS Clerk Admit Card? A3. Check the email that was sent to you by IBPS at the time of applying. Q4.What if my DOB (date of birth )gets rejected on the screen while accessing IBPS Clerk Admit Card? A4. Refer to your application. Q5.While downloading IBPS Clerk admit card, what if the screen displays a failed login message? A5. Enter the correct credentials to make sure you download the IBPS Clerk admit card. Q6. What is the salary of IBPS Clerk? A6. The initial Basic Pay for IBPS Clerk is Rs 11,765. The IBPS Clerk pay scale is: 11765-655/3-13730-815/3-16175-980/4-20095-1145/7-28110-2120/1-30230/1310-1-31540. Note: Candidates must carry the IBPS Clerk admit card to their exam center along with a valid photo identity card. Without the IBPS Clerk admit card candidates will not be allowed to enter the exam hall. The total number of questions have been reduced from 200 to 190. The total time duration for the exam has been increased from 135 minutes to 160 minutes. the Reasoning and Computer Aptitude sections, which were two separate sections until 2016, have been merged together into one single section. The number of questions and time duration for each section has also been changed. Now that you are provided with all the detailed information regarding IBPS Clerk Admit Card 2019. Candidates who wish to secure a job can take free IBPS Clerk Prelims & Mains Mock Test on embibe. This mock test gives you detailed feedback analysis in order to find out your weaker areas and further helps you to improve them. We hope that this detailed article on IBPS Clerk admit card helps you. If you face any issues concerning the IBPS Clerk Admit Card or any aspect of the exam in general, drop your query in the comments section below. We will get back to you at the earliest. When will the admit cards be out ? Can you suggest tips for reasoning section? The admit cards for pre-exam training are out already. The admit card for prelims will be issued around 20th. Are there some changes in prelims also or only mains pattern ? No there are no changes in the preliminary change. Only the mains stage will see some changes from this year onwards. Can we download question papers from your website ? You can surely download papers from our website. Official Site of IBPS is not opening.Then how shall I download IBPS Clerk admit card 2017?